The winning candidates will only hold office for 8 months - the whole executive are up for election in April 2014. The signs are that the election is very close, the General Secretary's election team (which calls itself the 'Broad Left') has been sending out increasingly desperate emailshots, 9 in total with the latest last Thursday. Electoral Reform Services (ERS) count the votes as they arrive. No one except them should know the figures but this information may have leaked before: In April 2000 the left anti-establishment candidate Sue Michie was banned from all office the day after the ballot closed and two days before the result was announced by ERS (she topped the poll). At the time we believed the results had been leaked to the union in advance, ERS denied it. Anyway if you haven't voted it is not too late. If you have lost your ballot paper down the back of the sofa it is not too late. Call free 0800 783 3856 or from the Republic of Ireland 0818 333 155 and they will send you a new ballot paper. The ballot closes on Tuesday 27th August. 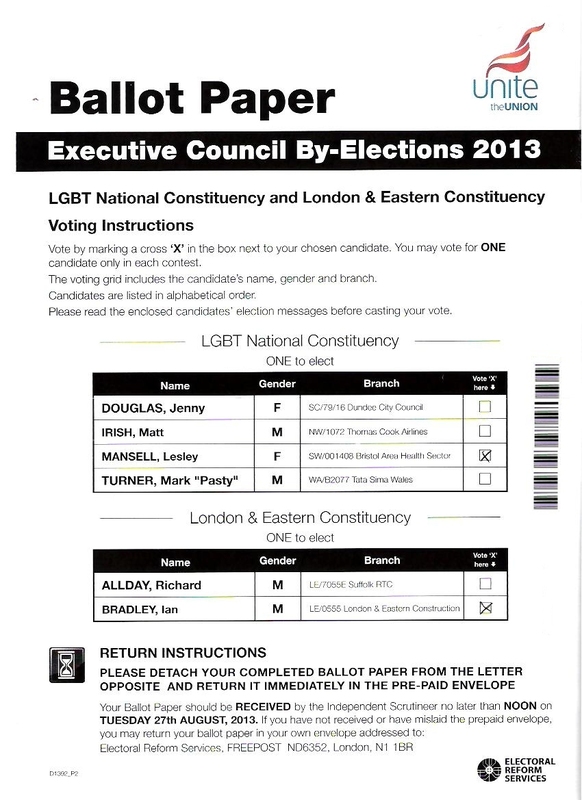 Vote for the Grass Roots Left Candidates Lesley Mansell (LGBT) and Ian Bradley (London And Eastern).